Rollover type which only looks like an Ethernet cable, but can be useful with Cisco equipment consoles. Usually light blue, sometimes with a 9-pin RS-232 connector on one end. Straight through type, connecting to networking equipment such as routers, hubs, and switches, which is the predominant cable type now. Crossover type which was necessary to connect computer to computer without any intervening network equipment. Becoming unnecessary. A fourth type, which has to be mentioned — home made cables with nonstandard pinouts, often non-Ethernet. Hopefully, someone labeled them and identified their use. The first place where you’ll have to figure out which cable is which is when you’re retrieving spare premade cables from your extras box. You should only save known good cables, but you can use a basic cable tester with remote to check out continuity and wiring. The Platinum Tools Lanseeker does an excellent job at this. For the less common TIA-568A arrangement, pins one and two are Green stripe and Green, and 3 and 6 are Orange stripe and Orange. The connections are the same, but the colors are swapped. You can identify them that way, and suspect which one you have just by the pin 1 color. Computer equipment sends data using pins 1 and 2, and receives using 3 and 6. This is part of a convention which is used when these connectors and cables are used for Ethernet. For shorthand, you can call this MDI, or the Medium-Dependent Interface. In the past, computer-to-computer “crossover” cables were needed when bypassing network equipment. As a variation, they were called MDI-X, for Medium-Dependent Interface Crossover. Network interfaces have advanced enough to detect cabling and switch pin usage as needed, so crossover cables are rarely used. Crossovers not only exchange pins 1 and 3, 2 and 6 to exchange data and transmit, but also 4 and 5 cross and connect to 7 and 8, exchanging blue and brown pairs. Testers such as the Platinum Tools VDV MapMaster 3.0 can check all of the exchanges in a crossover cable quickly and simply, and identify common wiring problems in the cable such as miswires and split pairs. Of course, it can’t detect wrong wire colors! For completeness, the rollover cable reverses every pin: 1 to 8, 2 to 7, etc., as if the wires were part of a ribbon cable which was reversed. If you have Cisco networking equipment nearby, you may have a few console cables in your cable box which are wired this way — beware! 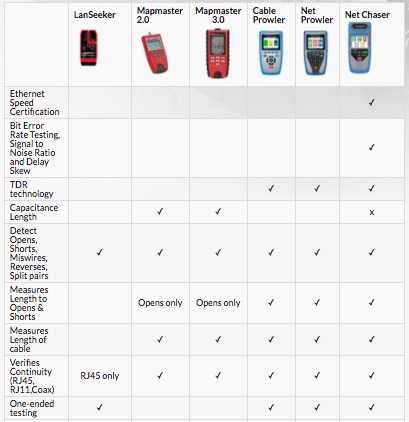 Testing devices such as the Platinum Tools VDV MapMaster 3.0 can verify cable wiring, check for shorts and opens, and verify more exotic cable configurations such as mixed data and video. They can also map cabling using the remote module. Testing longer lengths of cable may involve locating shorts and opens, conducting operational tests on data and PoE current transmitted on the wires, and even measuring cable length electronically. The Platinum Tools Cable Prowler can do all that, and much more. By comparing termination wire colors to standard usage and using testing devices, you can identify most cables and put them to use with confidence.